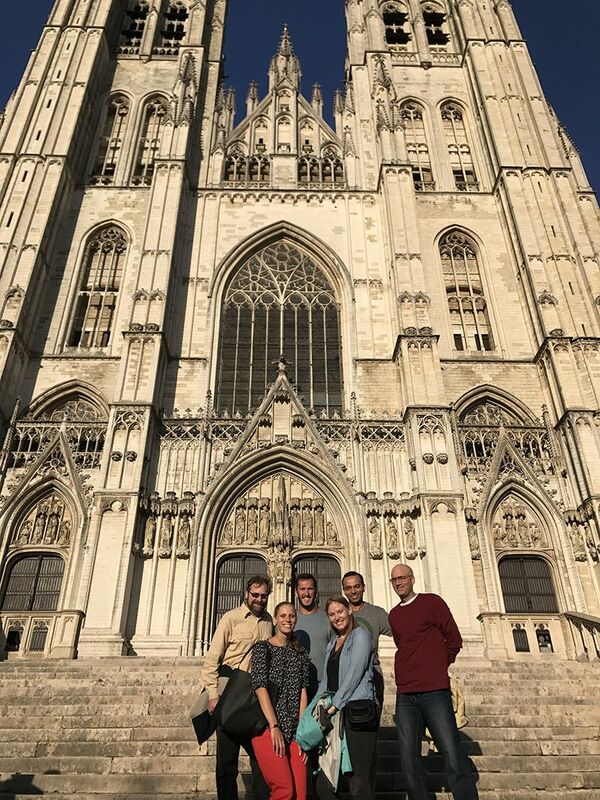 Department of Education Reform faculty members and students pose in front of a cathedral in Brussels at a previous Association for Public Policy Analysis and Management international meeting. A contingent of faculty, staff, students and alumni of the Department of Education Reform at the University of Arkansas will participate in the Association for Public Policy Analysis and Management meeting Thursday through Saturday in Chicago. It’s the 39th annual fall research conference of the association whose aim is to improve public policy and management by fostering excellence in research, analysis and education. Department of Education Reform researchers attend regularly to present findings, and they have also taken part in the association’s international conferences. The conferences include both practitioners and academics from public policy, not only education, giving U of A attendees a chance to network and reach a wider audience. The department offers a doctoral degree in education policy. The deadline to apply for admission is Jan. 10. Corey DeAngelis, a Distinguished Doctoral Fellow in the program, and Gema Zamarro, holder of the Twenty-First Century Chair in Teacher Quality, will present a poster titled “Does Private Schooling Affect Non-Cognitive Skills? International Evidence Based on Test and Survey Effort on PISA” (co-authored with Martin West of Harvard) on Thursday. Angela Watson, a Distinguished Doctoral Fellow, and Gary Ritter, holder of the Twenty-First Century Chair in Education Policy, will present a poster titled “A Promising Culture: College Going Culture and the El Dorado Promise” on Saturday. Molly Beck, a Distinguished Doctoral Fellow, will present a poster titled “Determinants of ELL Reclassification” on Saturday. Katherine Kopotic, a Distinguished Doctoral Fellow, and Gema Zamarro will present a poster titled “Can Parents’ Growth Mindset and Role Modeling Address STEM Gender Gaps?” (co-authored with Albert Cheng, an alumnus who is working on a postdoctoral research fellowship at Harvard University) on Friday. Brian Kisida, an alumnus and former senior research associate now at the University of Missouri, and Daniel Bowen, an alumnus who teaches at Texas A&M University, will present their paper “Casual Effects of Teacher Match on Student Achievement” (co-authored with Anna Egalite, an alumna who teaches at North Carolina State University), at a panel discussion titled “Short- and Long-Run Effects of Teacher-Student Race and Gender Congruence” on Friday. Jonathan Mills will serve as a discussant of a panel titled “Wide Effects of School Choice Programs” on Friday. Collin Hitt, an alumnus who teaches at Illinois State University, will serve as a discussant of a panel titled “Short-Term and Long-Term Impacts of School Choice.” Patrick Wolf, holder of the Twenty-First Century Chair in School Choice, and Jonathan Mills will present their paper “The Experimental Effects of the Louisiana Scholarship Program on Student Achievement after Three Years” on Thursday. Patrick Wolf and Kaitlin Anderson will present their paper “Evaluating School Vouchers: Evidence from a Within-Study Comparison” at a panel discussion titled “Using Within-Study Comparison Approaches to Examine Systematic Variation and Generalization of Treatment Effects” on Thursday. Malachi Nichols, a Doctoral Fellow, and Gema Zamarro will present their paper “College Readiness, Student Expectations and Success: The Role of Non-Cognitive Skills” (co-authored with Julie Trivitt, a clinical assistant professor of economics in the Sam M. Walton College of Business at the U of A) at a panel discussion titled “College Readiness: Skills, Assessment and Remediation” on Saturday. Bob Costrell, holder of the Twenty-First Century Chair in Education Accountability, will present a paper titled “Measuring the Cross-Subsidization of Teacher Pension Costs, Within and Across Generations” (co-authored with Josh McGee, a U of A alumnus and former research associate with the department who is with the Manhattan Institute and the Laura and John Arnold Foundation) at a panel discussion titled “The Impact of Public Sector Wage and Pension Policies” on Saturday. Sarah McKenzie, executive director of the Office for Education Policy, Leesa Foreman, a Distinguished Doctoral Fellow, and Yujie Sude, a Doctoral Fellow, are also attending the conference. Visit the conference website for live streaming of some special events and symposia.